There is a lot of pressure put on designers to make center cockpit layouts work in boats under 44 feet LOA; but I have felt for a long time that the center cockpit begins to make a lot of sense at or above 44 feet LOA. You can open any marine magazine and see lots of center cockpit boats around the 44 feet length and one of the newest is this design from the in-house group at Irwin. 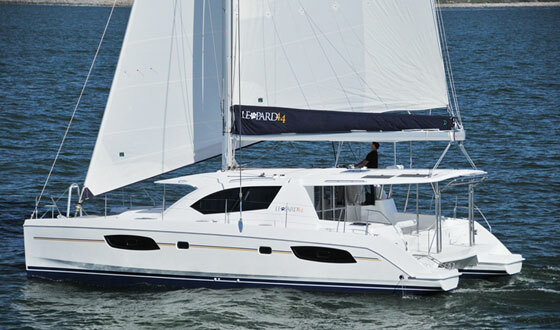 The Irwin 44 is the perfect length for two couples to cruise in comfort. 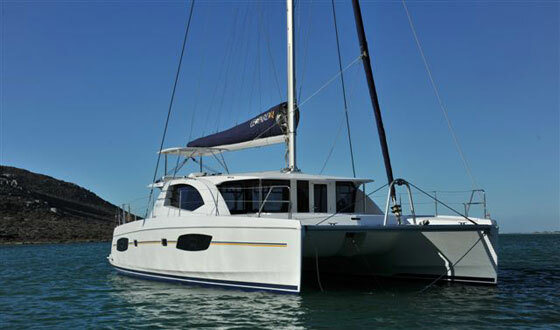 The LOA is low enough so that the boat is never a handful to handle in close quarters and the interior allows things to spread out for reasonable privacy and plenty of comfort. The layout drawing was done by a computer and, as you would expect, it's squeaky clean and rather lifeless. The layout itself is fine. The galley is spread along the passageway adjacent to the cockpit. Both staterooms have direct access to heads with shower stalls. Shower stalls on small yachts have been called lots of things, but I just call them popular. A clean sailor is a happy sailor. The biggest drawback to this layout is the size of the banquette and the table. You can seat four around this table, but that's it; and four will be tight. 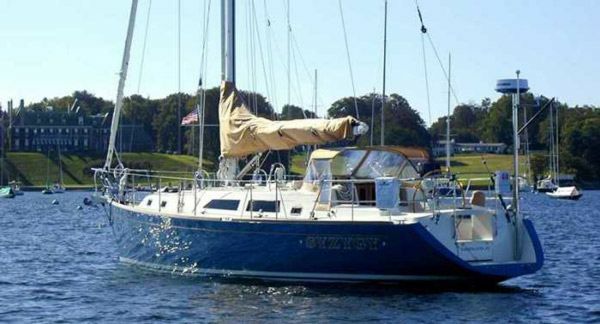 With the mast in this location and the settees so close to the companionway, which has been pushed forward to make room for the aft cabin and galley, a good drop-leaf table spanning the main cabin is impossible. Oh well, it would seem that I'm the only one these days that still likes a drop-leaf table. Note that the aft cabin has not been pushed all the way to the transom. It stops short to leave room for a big boarding step with built-in gangplank for Mediterranean stern-to moorings. The hull form features a wide BWL and corresponding slabbish topsides that turn fairly hard at BWL, go slack for a while, and then round off to a near tangent at the centerline. This shape should give excellent initial stability for those of you who have friends that don't like to tip. Everybody likes a stiff boat. But remember, you owe it to yourself to sail a narrow meter type — an Evergreen, PC, Dragon or my new boat, an Etchells — and experience the thrill of steering to weather from the lee side and trailing your fingers in that quarter wave rising just inches from your ear. 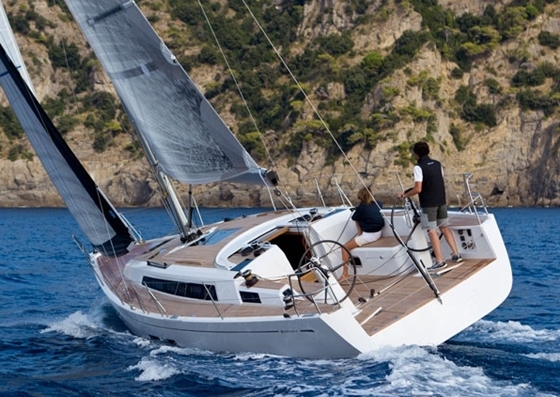 There is the distinct sensation that you are sailing at 12 knots when the water is so close. Go ahead, tip that "thang" over and feel like a sailor for a while. The keel is a low-aspect fin with plan form that tapers at both edges. The leading edge is strongly raked aft and I would think it might be a little excessive, but it will be easy to pull from the mold. Sometimes these practical considerations make a lot of sense to a builder. The rudder is on a partial skeg that allows some balance area and two bearings. The D/L ratio is moderate at 258. This sail plan has several interesting features. Despite the almost universal acceptance of double spreader rigs, this design goes back and uses a single spreader rig with intermediate uppers. 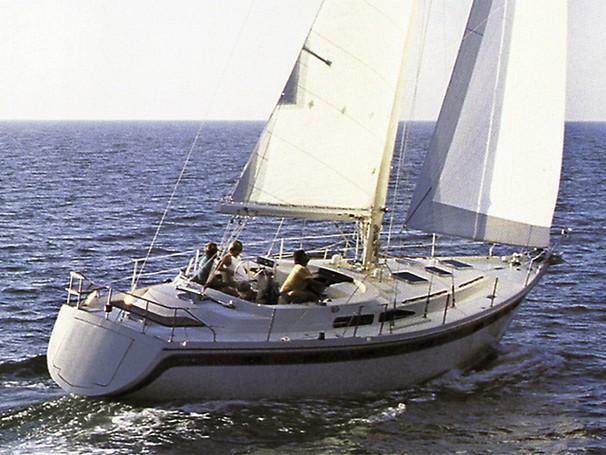 This is a rig that was common on racing yachts in the early days of the IOR. 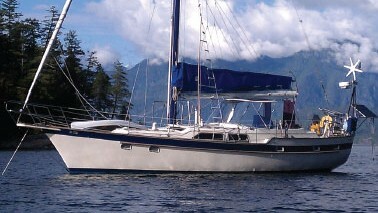 It requires a stout mast section and still may be the simplest way to effectively stay a sloop rig. Note that the fore and aft lowers have strong angles to them. Note also the "stive" or rise to the boom. For obvious reasons, my rule of thumb is that the boom will always appear to have more stive when sailing. 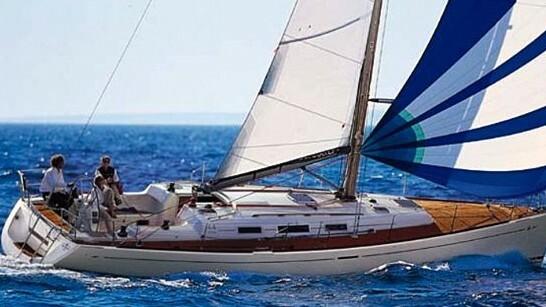 With this in mind, I draw no stive and if the client of a production yacht wants extra boom height to accommodate a maxi dodger, I let him handle that with the sailmaker. If you go with too much stive, you will always look like you're sailing with a flattening reef in and once you put that flattening reef in, you'll look like you're sporting an inverted fisherman's reef. The clew of the jib is also very high. I would guess that this has something to do with providing a foolproof rig for less-than-skilled charterers. You'll certainly have a clear view under the sails, and that can be a problem with center cockpit boats. The rig height is well under the Intracoastal Waterway limit. I study this design with interest. This is right in an area where I have done several designs, so I know the problems that are being addressed. Let's have headroom. Let's have a low and sleek profile. Give us a big cockpit and be sure there is lots of room in the interior. Oh, yes, by the way, make it fast in heavy air, fast in light air, etc. Sail area 856 sq. ft.